From the above ayah, I am reminded that Allah (سبحانه وتعالى ) has blessed us with faculties. One way of thanking Allah is to use the faculties given by Him in the ways which please Him. I decided to assess myself in light of an Assessment Table which I created for myself. This helped me analyze the use of the blessings given to me by Allah and decide whether I used them in His way or not. 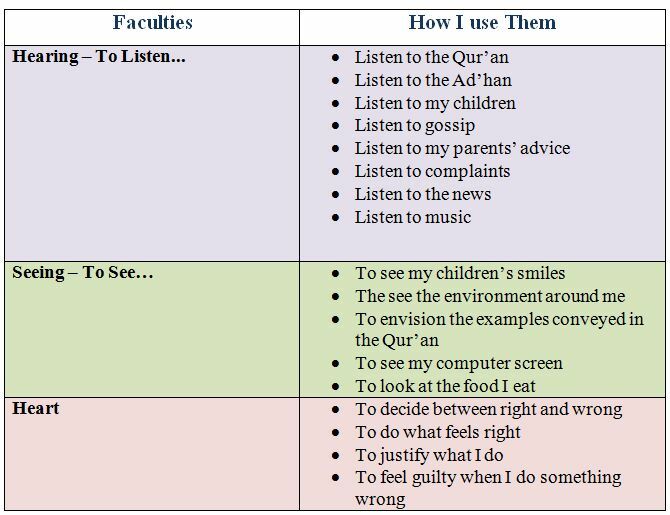 There are some activities in which I use the faculties given to me by Almighty Allah in displeasing Him: like using my hearing for listening to music while I work out, or when I use my ears for some juicy gossip or some slandering, like when I use my eyes to see things on TV that I am not supposed to, or when I use my heart to justify or make excuses for doing something wrong. Also, I use my heart to satisfy my nafs and go against the wishes of Almighty Allah. As soon as I begin indulging in gossip or begin to complain, I need to remind myself that my tongue is a blessing from Allah and it should only be used to say things that please Him most. I seek refuge from Allah (سبحانه وتعالى) from seeing no evil, hearing no evil, and feeling no evil! Ameen. This entry was posted in Uncategorized and tagged heart, Surah As-Sajdah, Thanking Allah, Use of Ears, Use of Eyes, Use of Faculties. Bookmark the permalink. I look at the phrase: قَلِيلًا مَّا تَشْكُرُونَ . We take so many of our faculties for granted. It is only when we see maybe handicap people, we think that Allah (SWT) has truly blessed us and maybe sometimes not even then. Wherever we go, whatever we do we create an impact on our surroundings. We leave impressions not only on people we meet but also the environment! Everything is being recorded and can eventually go in our favor or against! May Allah make us a source of barakah wherever we go and may we spread the light of the Quran and Sunnah. Ameen.